Techniques: I chalked everything with Mocha Mama chalk ink. I just got back from the Quick Quotes Private Reserve in Dallas where Michelle (DT and QQ Teacher) taught us how to make some super cute photo corners! To make these, you will need a piece of rectangle shaped paper that is twice as long as it is tall (for instance; 2” long by 1” tall). Take the top two corners and fold them down to meet in the middle to form a tent shape. For this layout, I had the “seam” facing outward and punched 2 holes in each flap and tied it with ribbon to hold it closed. You can also create a seamless look and glue the photo corners in place with the seam down. I also used a transparency that we received in one of our Private Reserve layout classes. The stripe with the quote along the top is sooo cute and matched the Julie Je t'aime Paperline. To attach the transparency, I applied adhesive along the darkest parts of the image so the adhesive would not show through. Check out all of the fab Petaloo flowers that I used on my layout! These flowers are so easy to work with. 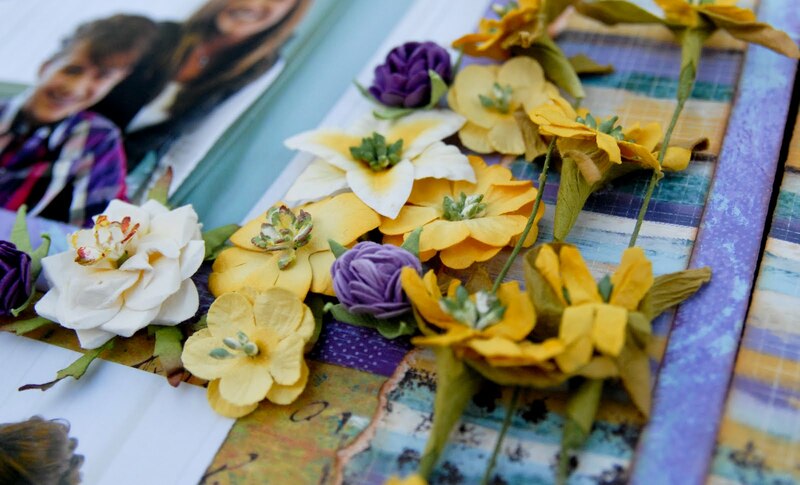 The smaller flowers already have an adhesive foam backing, so applying them to your layout is really quick and easy. The yellow border flowers are also Petaloo and can be applied as a strip to create a border (as I did on my left hand page) or they can be cut apart to create single page elements. I applied the border with Beacons 3 in1 Glue. 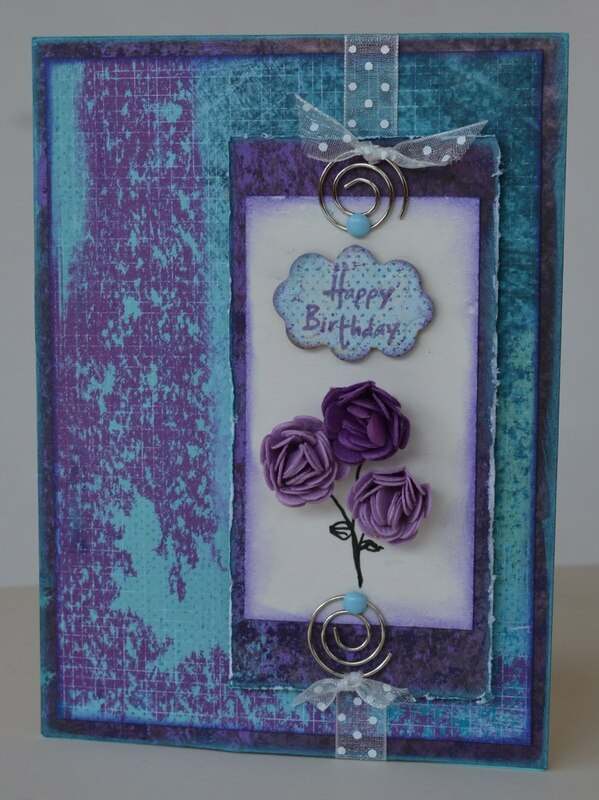 I created this card with the Julie Je t'amie papers, QQ chalking ink in Tahiti & Purple passion, and Petaloo flowers. 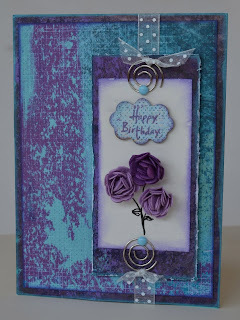 I used my Grand Caliber machine by Spellbinders to cut & emboss my 'happy birthday' tag. I just bought a new flat iron and decided to keep the box it came in and alter it. Right now it is storing my other flowers but I may use it as a gift box for an upcoming birthday. This was created with Julie Je T'amie Quick Quotes papers & Tahiti chalking ink. Then I finished it off with 'gorgeous' Petaloo flowers and ribbon. Of course I'm a follower. The altered box is fantastic! Gorgeous projects! !I am a follower! Love the altered box!!! what a fun idea!! Ohhhh Em Gee! Look at these! 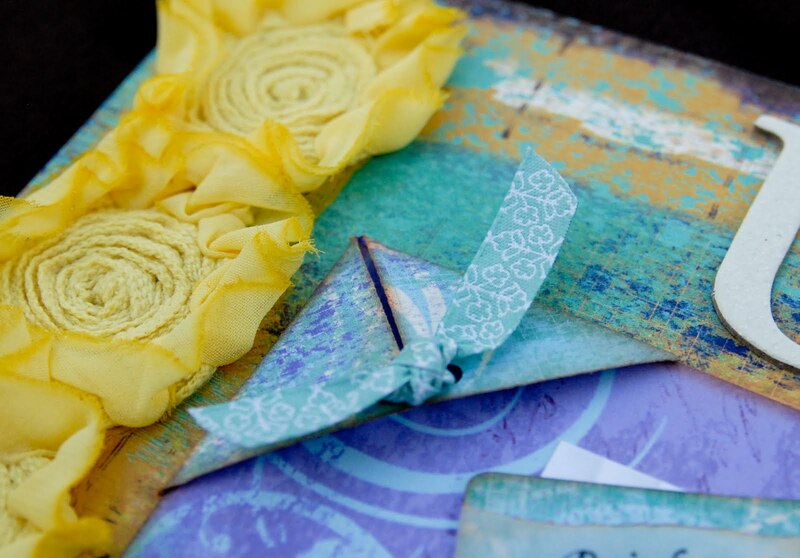 Jen, your layout is so colorful and do those gorgeous Petaloo flowers ever show up on these beautiful papers! I love the photos too. There aren't many things more fun than a trip to the salon! And Lisa, your card and altered box are out of this world! I love altering boxes myself. Again these colors are so vibrant and rich. I think Julie Je T'aime is my favorite collection now. Can't wait to pop over and see what the Petlaoo team had done for today! Beautiful projects! LOVE those fantastic colors! great projects. wish i were this talented. tfs. i'm a follower of course. wow, gorgeous! I love the yellow and blue color combo, beautiful! These are all so beautiful. 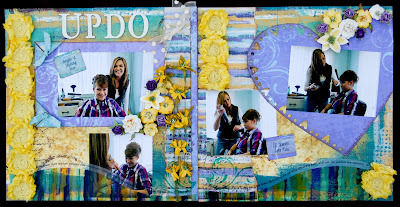 Love the photo corner idea and the LO. Great idea on the box! Perfect solution for beautiful photo corners. Thanks, Jen. Love your color choices. beautiful creations. 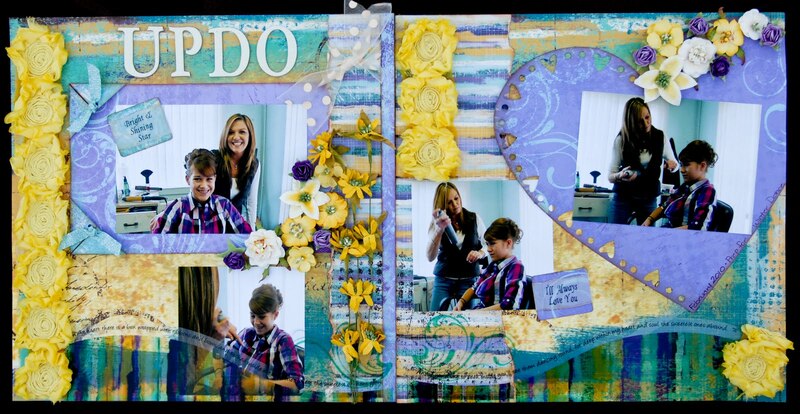 the layout is wonderful, love the photo corner idea. the card is gorgeous, love the color. great way to do the swirl paperclips and ribbon. wonderful reuse of a box, love the colors and flowers. thank you for sharing them. More wonderful projects! Really love the altered box. Stunning projects. Love all the fabulous colors and designs. Love how you did the page layout and love the flowers. Beautiful projects. Love those flowers. Love the photo corners tied with ribbon. So cute! Thank you Jen for the great photo corner info. Lisa, your box is amazing. I love how bright and colorful your layout is Jen. Lisa, your box is beautiful inspiration for some gifts I need to make. Fantastic job ladies!